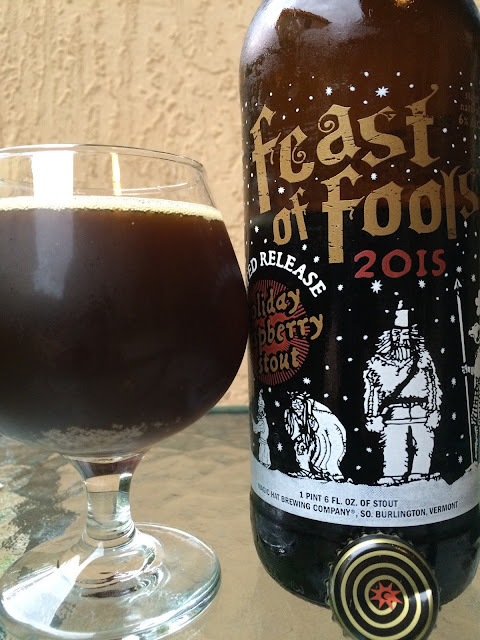 Magic Hat recently sent me a bomber of one of their rarer beers, Feast of Fools Holiday Raspberry Stout 2015. The label is pretty fun, depicting a line of fools standing in the snow all around the bottle. As the snow begins to fall, perhaps each is just hoping the line to buy a bottle of this limited release beer moves more quickly! Magic Hat will donate $5,000 to Vermont Foodbank with proceeds from this beer , providing 15,000 meals for their neighbors. You can help by donating directly yourself as well. 6.0% alcohol. 28 IBU. Chocolate and light roasty aroma, raspberries only the faintest in the background. However, raspberry flavors burst on the scene from sip one, excellent tartness with a jam-like flavor. That against the backdrop of cocoa and a medium chocolaty rich base and yum! Not sweet or bitter, very well-rounded. Great raspberry flavors complement the cocoa perfectly. Any "stoutiness" is cut by the fruity tartness, even to the point where it's hard to recognize this as a stout. Yummy malty fruity beer? Yep! Check it out!